The Adam Sheda Memorial Fund was begun in August of 2007 to honor and remember our friend and faithful supporter, Adam. The Fund will be managed as an endowment with the earnings going only toward the most urgent projects and children in need. This fund will NOT be used for operating expenses. Your donations to the Fund will be evergreen. “Adam Michael Sheda was born on June 6, 1981. He was born and raised in Wrenshall , Minnesota . He always had an interest in the military and joined the Army when he was 18. He was stationed in Germany for three years. After his enlistment in the Army, Adam joined the Minnesota National Guard. He was deployed to Iraq for 22 months. One week after returning home, Adam was killed on June 30, 2007. Adam was only 26 when he was killed. We always knew what a wonderful person he was. He loved his family and friends, often writing letters or emails, calling, or visiting relatives when he was on leave. So many people in our community have let us know how Adam visited them every chance he got. Adam loved animals, having many pets throughout his life including rabbits, pygmy goats, dogs and fish. He always wanted to be in the military. As a child, Adam would dress up in camouflage gear and eat MRE’s (Meals Ready to Eat) in the woods. 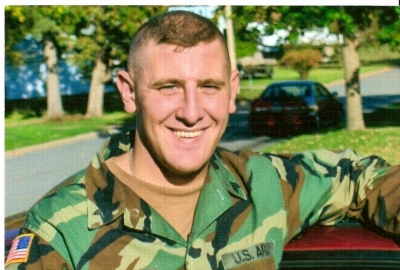 After the Army he joined the National Guard and was deployed to Iraq in October of 2005. Adam was a collector of military history. He traveled all over Europe during his enlistment in the Army collecting pieces of history . Adam was an artist. He enjoyed painting pictures of military planes and tanks. He also painted portraits. He had painted his sister Suzy, himself, renown military figures, animals, and most recently was working on one of his niece, Emma (age 4) that he never got to finish. While in Iraq , Adam had some of us sending him candy and toys for the Iraqi children. One day he had seen some children playing with a dead crow and it tore at his heartstrings. He sent money home so his sister would send him toys for those children. One of Adam’s favorite pastimes was driving his 1970 Mustang, though he spent more time fixing it than driving it. Though Adam will be missed for all of these qualities, it is his sense of humor we will all miss the most. Adam was always joking about something or someone. He did hilarious impersonations of people he knew such as his drill sergeants and celebrities. He often called us with prank phone calls and we were never sure if it was Adam or not. The stories we share with each other about Adam’s sense of humor are the memories that keep him alive in our hearts. Adam was a world traveler and made friends wherever he went. Sadly, it is through his death that we have found out what a truly compassionate person Adam was. We have discovered that Adam sponsored children and orphanages in Russia and Africa . One of the organizations he supported was iOrphan, many projects, and a child from the Vladivostok Orphanage #1. We assume Adam chose this area because of his love of Russian culture. He had visited Russia in 2005, had many friends there, was learning the language, and planned to return in January to study.